Partnership for Transparency is excited to announce that its partners will be presenting on the Transparency and Accountability in Mongolian Education (TAME) project at the Global Partners Forum 2017 on Tuesday, October 31 at 10:45 am. 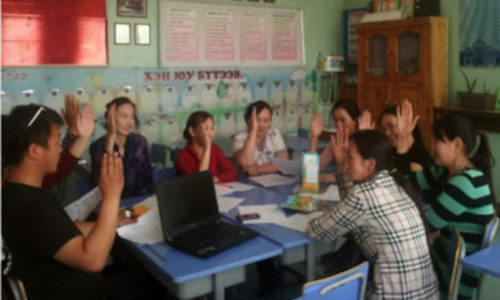 The TAME project addresses the development challenge of providing disadvantaged ethnic minorities of Mongolia access to better education services. The project intends to achieve this overarching objective by increasing efficiency, transparency and accountability in education procurement, organizing a Parent Teacher Association in each project soum, and promoting civic society participation in prioritizing educational initiative. The education reforms are expected to directly benefit 90% of Mongolia’s ethnic minorities who will have better access to quality education by the end of the project. In the last nine months, the project has helped establish five Parent Teacher Associations, trained 48 citizen monitors in school budget monitoring, and convened over ten stakeholder meetings reaching 480 people to intermediate between parents, teachers, and government officials. As result, school budgets have become more accountable to parents, students’ academic performance has increased, and parent-teacher relations have improved. The TAME project is funded by the Global Partnership for Social Accountability (GPSA) at the World Bank. GSPA’s annual conference, the Global Partners Forum convenes social accountability practitioners from around the world to reflect on successes and PTF is proud to have supported a featured project. Learn more about PTF’s work with TAME and the Global Partners Forum 2017 session.